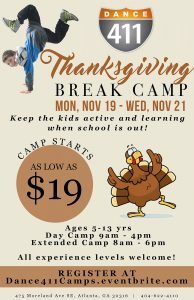 Kids Dance 411 Thanksgiving Break Dance & Theater Camp is enrolling now for November 19th – 21st. Students will learn acting, ballet, hip hop and jazz plus a specialty class to enhance their performance capabilities. At the end of the week of Friday, kids put on a performance for their friends and families. Sessions are daily from 9 am – 4 pm. Extended Care is available until 6 pm. Camp is designed to help students enhance their creative abilities and become well round performers. Instruction is differentiated based on skill level beginner to advance performers are welcome. HURRY SPACE FILLS QUICKLY Visit our website for more information. Mission for Movement is a non-profit organization committed to the promotion and celebration of dance. BTM supports those under served in the arts community through mentoring, opportunities, resources and education. Behind the Movement “Refuge” is a benefit show to support these efforts.